2.When connecting with USB device, you Can't put photos in the U disk directly, Must create a new file named "DCIM" (Most camera have this file).Then send photos to this file, insert the usb to OTG, after 3-7 seconds, iPAD will automatically pop-up the picture window. 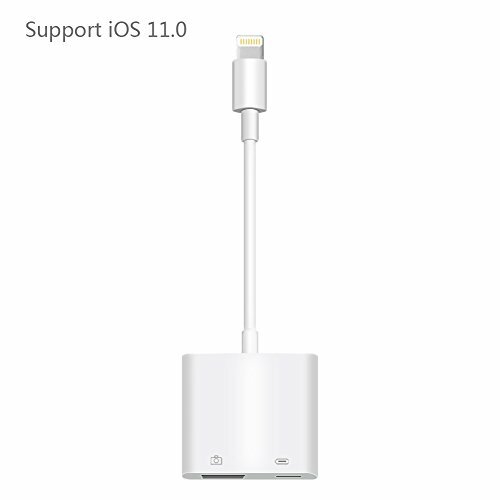 3.This adapter can not support USB devices over 100mA, please check your devices current. How to check the working current of your USB devices? First, you should download "ChipGenius" software on your computer. Then insert U disk into the computer, use "ChipGenius" to detect the U disk information. 4.Only for transfer photos and videos. 1.Turn on iPhone & iPad and attach the Lightning to USB Camera Adapter to the Lighting port. 2.Turn on your camera or iOS device and connect it to the Lightning to USB Camera Adapter using the USB cable that came with your camera or device. If you have any questions about this product by Aiguozer, contact us by completing and submitting the form below. If you are looking for a specif part number, please include it with your message.